While SurveyMonkey offers a free edition, this edition does not allow integration with other applications and is also limited to the number of questions and responses per survey. The minimum edition that is required is the Standard Plan. The SurveyMonkey Plans and Pricing page will help you understand the available options and how to subscribe. Only one SurveyMonkey account can be connected to a Wisenet account at any one time. You need Portal Admin access to connect SurveyMonkey to Wisenet. 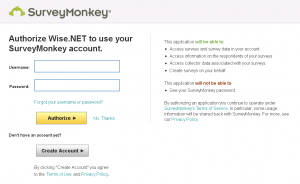 If you already have a SurveyMonkey account you can use the same account to Set Up the integration in Wisenet. Only one SurveyMonkey account at a time can be connected to each Wisenet database. It is not able to be connected per user. SurveyMonkey Enterprise allows you to have access with different permissions for different people in the same organisation. SurveyMonkey makes it easy to create a survey from scratch or from a template. Just follow the steps provided from the SurveyMonkey Help Centre to get started. IMPORTANT NOTE: Please ensure to only do this once as it will create duplicate surveys otherwise. Note: You will need to have at least the Select Edition of SurveyMonkey for this to work. You can send a link to a survey collector group directly from within Wisenet. This can be completed individually or in bulk from a Course Offer. We will try to answer your most common questions about Survey Monkey Integration on the FAQ page.